1) In the lower right corner, near the power plug there should be a little red light that comes on when you power it up. After a few seconds the green light next to it should blink. If the green light is not on or blinking it is the SD card. May sure you have inserted the SD card. 2) remove the SD card and reinsert it. Power it up again. 3) Still not working, Send us your address and we will send you a new SD card. support@booleangirltech.com is the email address. In rare instances, the computer may not boot to the desktop and instead ask for a user name and password. The default user name is ‘pi’ and the password is ‘raspberry’. I changed the menu font size so that it’s very large and I can’t find a way to decrease it. It appears one can’t adjust the font in the GUI to select a smaller font because the text is so large you can’t see/get to the place to make the font adjustment. To fix this issue, press ALT +Space and select “Move” from the menu that appears allows one to grab the pull down menu and move it up until you can get to the place to change the system font. The best way to buy a Boolean Box is on Amazon. From the US Amazon site you can purchase a Boolean Box and they will ship it almost anywhere in the world. Their shipping internationally is much cheaper than any we could offer. There are lots of reasons for not having sound. Before you try anything else verify that your monitor/TV has sound. There are two ways to get sound out of the computer: 1) through the HDMI cable to your monitor/tv. 2) through the audio port or headphone jack. If you are trying to get sound through the TV, make sure the HDMI cable is plugged in to the TV and the TV is on before you start the computer. For sound to work the computer must sense that the speakers exist. If the computer gets booted up before the monitor is connected the computer may be defaulting to headphones. If sound is not working, try restarting the computer. If your TV has modes try game mode. Some TV’s only take 3rd party sound in Game mode. If that doesn’t work, there is a configuration setting. In the upper right corner is a volume control. If you right click you get a selector. Pick HDMI and that should work. Also, make sure the volume is turned up. If that fails, there are several other ways to configure the audio output if it does not work after a reboot. Checkout this article for the details. The audio port is great for headphones. Again, if the headphones don’t work, try rebooting first. The Raspberry Pi audio port is designed for headphones. It cannot supply the current required by a passive speaker, so you’ll need to buy a set of powered speakers. Recommended power speakers are here. I ordered my box, it arrived! Now what? Visit Boolean University: https://booleangirl.org/boolean-university/. Click on Get Started, register on the website, and you’ll see a video showing you how to build your Boolean Box. One you’re connected, you can start your first project! Once I’ve built the Boolean Box, what can I do with it? Is this a “one and done” project? The beauty of this kit is that your daughter (or son) can do tons of things with it. Younger children (7 or 8 years old) can learn to program in Scratch a block programming language designed for kids. Once they know a little about programming in Scratch, they can build electronics projects using the lights and buttons included. These projects can be programmed in Scratch. BTW, high schools and colleges use Scratch to teach students to code so it is not just for little kids. There is also a cool animation package: 9va-pi. Older kids, 5 – 8 grade and beyond, can learn to program in Python. A great place to start is modifying Minecraft (included) with python. They can also learn Python by building the electronics projects in python instead of Scratch. There is tons more: Java, Mathmatica,…. You can see many projects on the Boolean Girl website but the internet is full of additional projects. People have even added components to the kit and build there own version of an Amazon echo powered by Alexa. I’m looking for additional components and a monitor, do you have any recommendations? Yes! Check out our recommendations page. I ordered a box, but I’m missing a piece, or a piece is defective. What can I do? Please send us an email at: support@booleangirltech.com and describe your problem. Attach photos if you can. Please include your order number. We will ship you a new piece right away. For the most part Wifi is not required. We never use a network connection in our classes. Advanced user do connect to the internet to download new software Etc. All the projects can be done with the software installed on the Raspberry Pi. If you want to connect to WiFi, there is an icon for setting up WiFi on the upper right side of the desktop. How do you resize the display from the boolean box computer to fit the HDMI monitor? Click on Set Resolution and pick a better resolution – we use DMT mode 81 1366×768 60Hz pretty frequently. That might be a place to start. Our nonprofit arm, Boolean Girl, is active on social media. Connect with us! I’d like to buy a monitor for my Boolean Box. Do you have any recommendations? 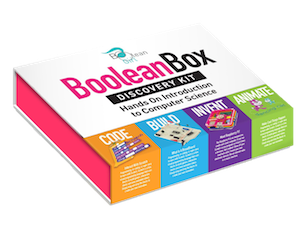 Great news, you can order Boolean Box on the US Amazon site and they will ship to most locations around the world. They get great international shipping rates so the cost is mush lower that we could ever do. Does my Boolean Box need batteries? How can I order a large quantity of Boolean Boxes for use in a classroom, club, or summer camp? Please contact us at support@booleangirltech.com and include your name, phone number, and the best time to reach you and we will give you a call to discuss some options. I ordered a box, but I would like to return it. How can I make a return? Before you start the return process, please contact us at Support@booleangirltech.com. We’d like to see if we can address your issue with out making a return. If you need to make a return of an item purchased on Amazon, follow the Amazon return process. If you purchased from us, just email us and we will send instructions for returns. What is your warranty information?